Innovative Language Learning Blog» Blog Archive » Perfect Your Pronunciation with the Improved Voice Recording Tool! « Coming Soon: Visual Dictionary Pro - Learn 30 Languages in One Vocab App for the iPhone and iPad! Perfect Your Pronunciation with the Improved Voice Recording Tool! You’re regularly exposed to native speakers and conversations in our lessons. But do you actively practice pronunciation and the proper accent? If not, now’s the time to start. How would you do it? Simply listening and repeating speakers isn’t enough. You need to hear how you actually sound as opposed to how you think you sound . So, naturally, recording and comparing yourself is one of the best ways of knowing how close your language is to that of a native speaker. In fact, you can start doing this with your lessons on any of our 101 language sites. 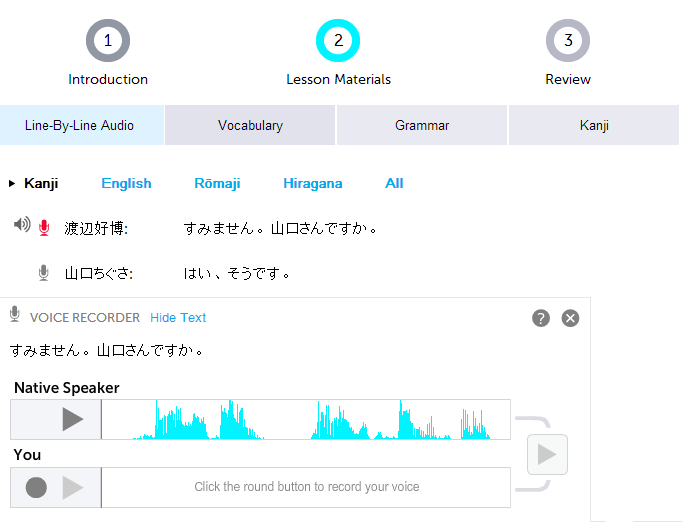 To Access The Voice Recorder, visit any lesson and click on (2) Lesson Materials. In the Line-by-Line Audio Tab, you’ll see a microphone by each individual line of the conversation. Click on the microphone icon to load the Voice Recorder for that specific line to hear the native speaker. Then, press the record button to record yourself. Once you’re done, you can either listen to the native version, then your version to compare, OR play both simultaneously to see just how close you are to the native speaker. For iOS Users: Please note that the Voice Recording Tool requires Flash to work. However, we are working on a non-flash (HTML5) version of the Voice Recording Tool. Stay tuned for future updates. This entry was posted on Monday, August 19th, 2013 at 12:57 pm	and is filed under Foreign Language, General Announcements. You can follow any responses to this entry through the RSS 2.0 feed. You can leave a response, or trackback from your own site.